Lepidothamnus laxifolius, first described in 1982 by (Hook. f.) Christopher John Quinn (born 1936), is commonly known as Mountain rimu, pygmy pine. The epithet "laxifolius" means "loose leaf" in the Latin language referring to adult needles that stand up of slightly forward from the branchlets rather than hugging them tight as is seen in other species within the genus. The common name, Pygmy pine, is quite appropriate as it has the smallest mature size of any extant conifer. Description. Mountain rimu is a prostrate or sub-erect shrubby coniferous tree which grows to heights of 1 to 3 feet (30 - 100 cm) without a main trunk. Crown is low, open, and irregular. Plants are often monoecious. Branches are slender, rambling and trailing, circa 0.08 to 0.2 inch (2 - 5 mm) in diameter and up to 40 inches (1 m) or more long. They will root where to make contact with the ground. Branchlets often have a a mixture of leaf forms. Leaves of juvenile plants are lax, spreading, narrow-linear, acute, flat, and curved in shape. They are 0.2 to 0.48 inch (5 - 12 mm) long, passing gradually into the adult leaves, which are linear-oblong, blunt or sub-acute in form, 0.04 to 0.08 inch (1 - 2 mm) long, appressed, imbricate, oblong-ovate, obtuse, keeled; scale-like in form. Pollen cones are solitary, terminal on branchlets, stemless, and up to 0.32 inch (8 mm) long with a broadly triangular, acute apiculus. Seed cones are solitary at branchlet terminals, held by a swollen, succulent crimson receptacle (podocarpium) that is rarely dry. 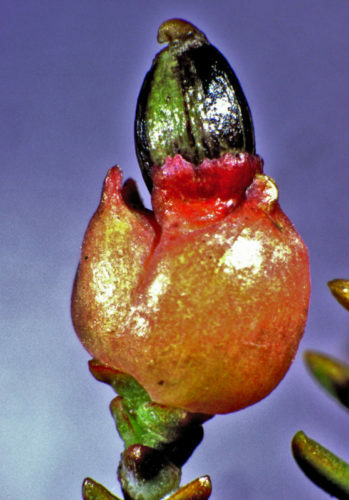 Seed is 0.12 to 0.2 inch (3 - 5 mm) long, shiny brown in color, nutlike in consistency; obtuse, oblong-cylindrical in shape with a stout, curved apiculus that is exserted far beyond the epimatium. Distribution. 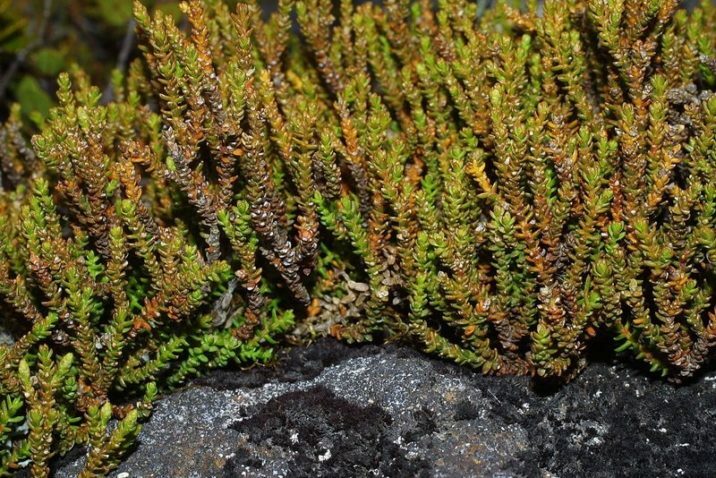 This species is native to New Zealand's North, South and Stewart Islands growing as part of Montane and subalpine scrub and moorland from latitude 39° southwards; also lowland in Stewart Island. Also occurs in alpine scrub, often as a trailing shrub on steep slopes where mean annual precipitation is 122 inches (3,098) mm. It is hardy to USDA Zone 7, cold hardiness limit between 0º and 10ºF (-17.7°C and -12.2°C). 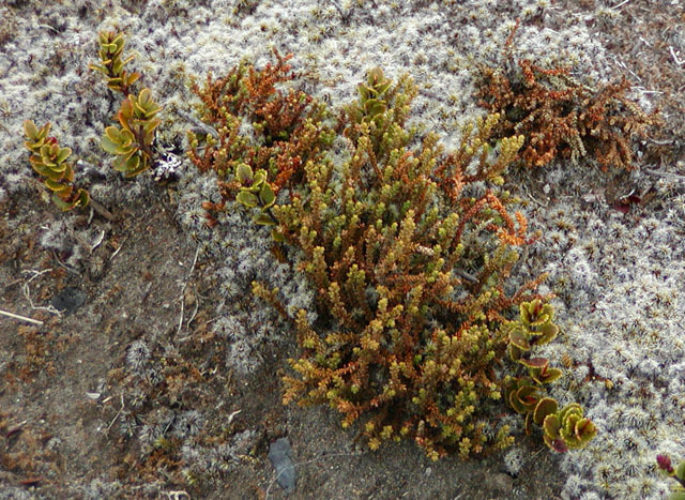 Lepidothamnus laxifolius — a mature specimen growing in nature, about 20 cm across growing in cushion tundra at Tongariro Crossing, New Zealand. Lepidothamnus laxifolius — a closeup of branch detail. Lepidothamnus laxifolius — a closeup seed cone detail.